The Bulls baby! Sounds assertive. Sounds filled with force. Sounds angry and ready for action. Ok – so here’s the deal. I have learned through this process that I am a straight up perfectionist. It’s all or nothing. I can’t just play for fun. I have to go in and annihilate. That was my mindset this last week and I was having a real issue because I wanted to win but I have never played before so I knew that I had no skill. Where did that leave me? The worst player with the most drive. A HORRIBLE PLACE TO BE. I didn’t know how to reconcile all of it and it left me with a ton of anxiety. When I got to the field, I was expecting Shea Stadium and it looked little league sized. In fact, I’m pretty sure it WAS where children played. So, right there half of my anxiety released. I thought the outfield was going to be a half a mile away and it was basically right next to the bases. Doable. Then it was time to figure out who was going to do what. You’d think we would have that down ahead of time, right? Wrong. Someone whipped out a drawing from their kids and we jotted down a lineup two minutes before hitting the field. We had nothing to hold it up, so we used the fence. Ghetto fabulous but it worked. We grabbed a photo before the start of the game and off we went. And… we went and went until the mercy rule came into play. 15-0 was the final score. Hilarious. 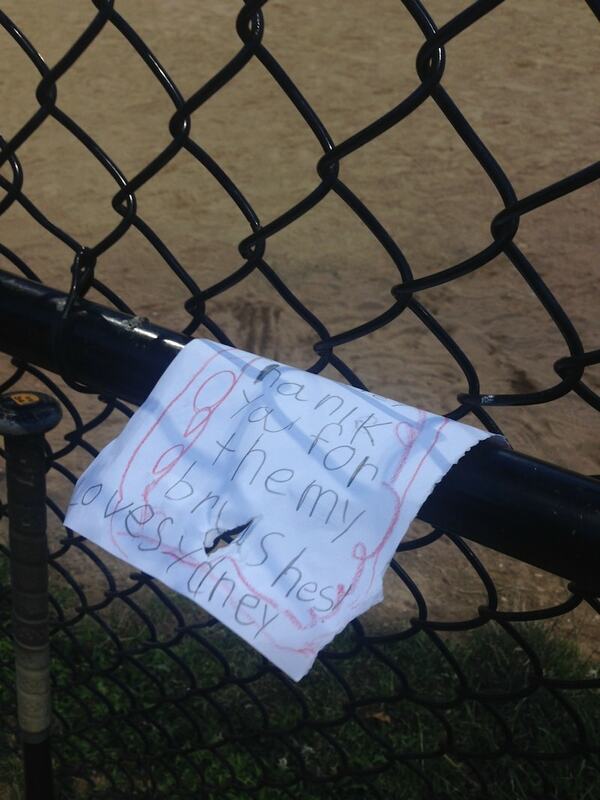 The umpire came up to us and was like…. you have to score 4 runs this inning or it’s over ladies. 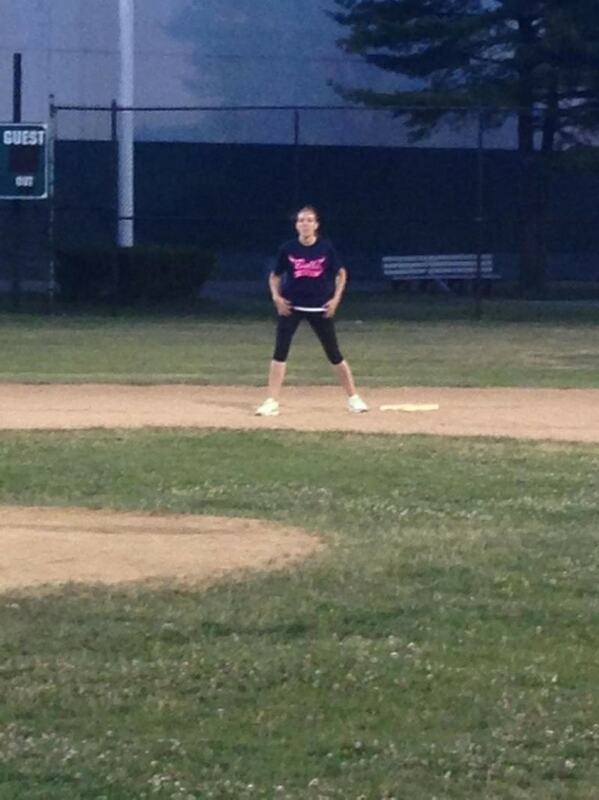 I got to second base (and was just about to touch third) but then it was all over. Our last out. Honestly, I no longer have that “we have to win” mentality because now I know with all my heart where we stand. HA! The team that we played against said they’ve been together for 15 years. How can we compete against that? Most of us have never played. And those who have played haven’t touched a bat in 20 years. We can’t take ourselves too seriously. I let it all go after the first inning. 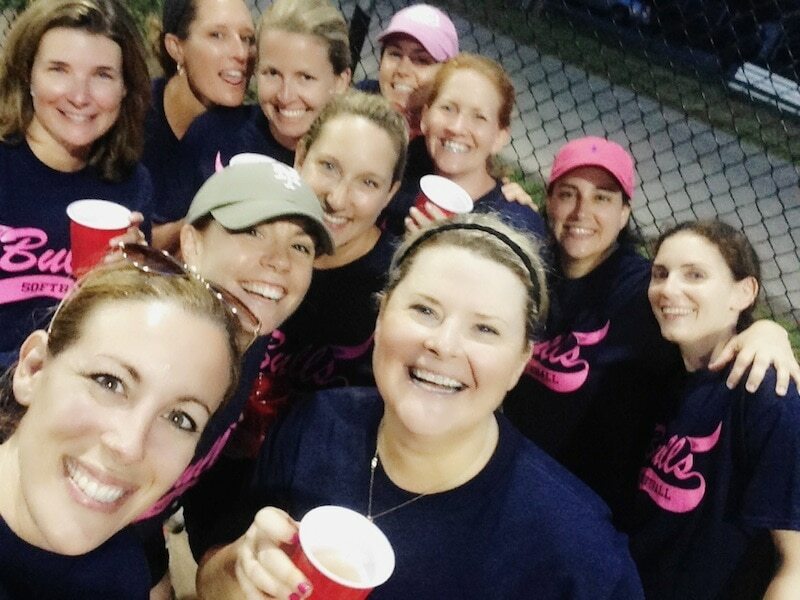 Now it’s all about hanging with my girls, having fun and giving it my all… but not expecting to win the World Series. Someone said they joined the team simply for the after party. And I can see why. After the game, we all headed out for a drink and had a ton of laughs. 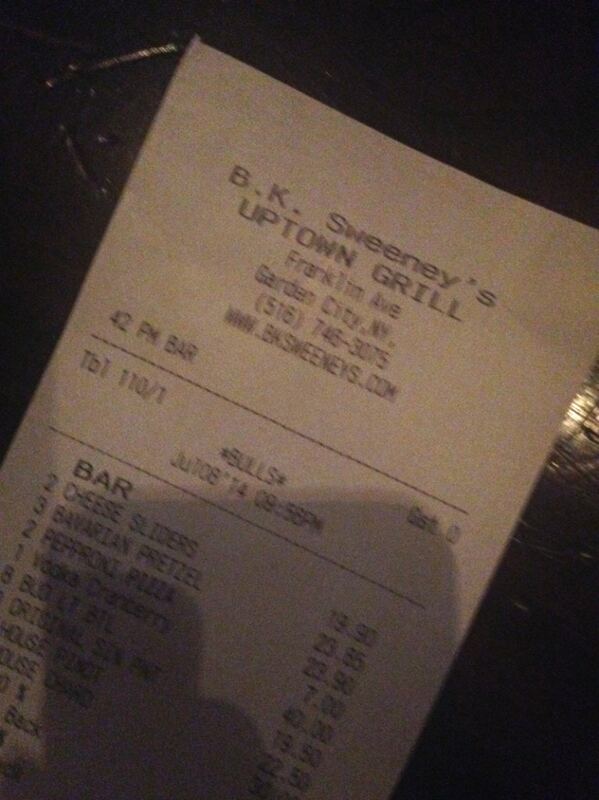 Notice the receipt — the bartender put “The Bulls” as the name of our group. HA! Such a great group of girls. Most of them are really close – best friends for LIFE. I am sort of on the outskirts of all of that but I still enjoy spending time with them because they are really amazing. I had a great time yesterday – smiling and laughing for hours. You cannot ask for a better evening. I am SO HAPPY I joined this team. 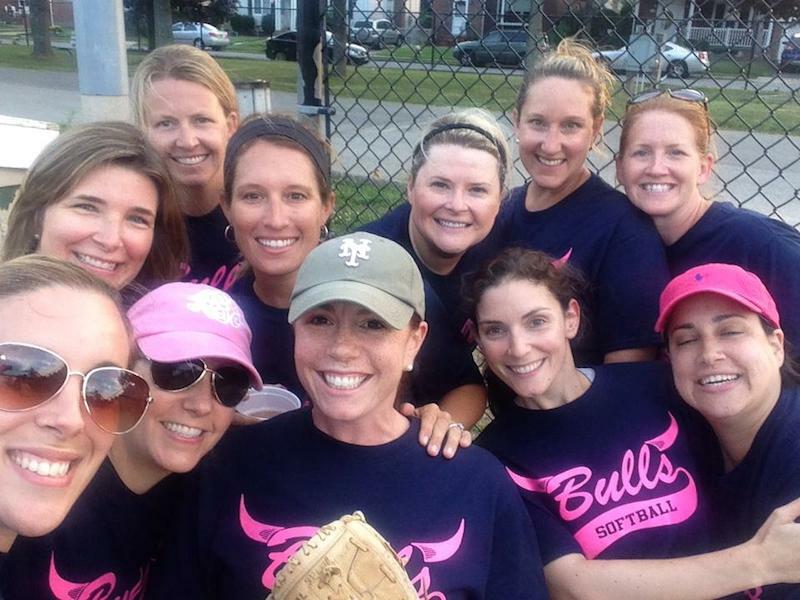 Who would have thought that I would be on a softball team?? Never in a million years!! But it was the best decision ever.